Today we’re going to take a look at my top five picks for best keyboard. 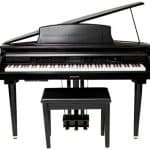 We’ll look at stage pianos and piano workstations that would suit most professionals. Some keyboards are more geared towards live playing and others towards productions, although there is always some crossover between the two. I’m a full-time keyboard player, and have tried all of these keyboards at different times. Any of these keyboards would serve you well. It just depends what you’ll be primarily using the keyboard for and what your budget is. Let’s dive in with a classic. What Should I Look For In A Keyboard? The Nord Electro 4 has been my go-to keyboard for many years now. It’s got waterfall weighted keys, which I love. Basically, they are more weighted than a MIDI keyboard, but not full weighted like some pianos. This makes it perfect for funky synth, EP, and clav parts, while having the same general weight as an organ. Playing actual piano on it doesn’t feel weird either. Many of the onboard sounds are killer. The organ generator is great, the Grand Piano is beautiful and convincing, and the Wurlitzer is one of the better Wurli tones I’ve heard. 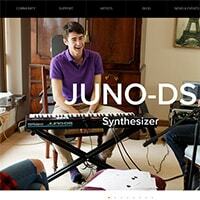 It comes loaded with around 35 synth tones, ranging from strings to analog horns. Many of these are quality sounds, but not all of them are useful. Thankfully, you can easily load new sounds onto the Nord using their Sample Editor and Sound Manager apps. These keyboards are extremely well-built. They’re built for the road, and with a bit of maintenance, they’ll last you a long, long time. 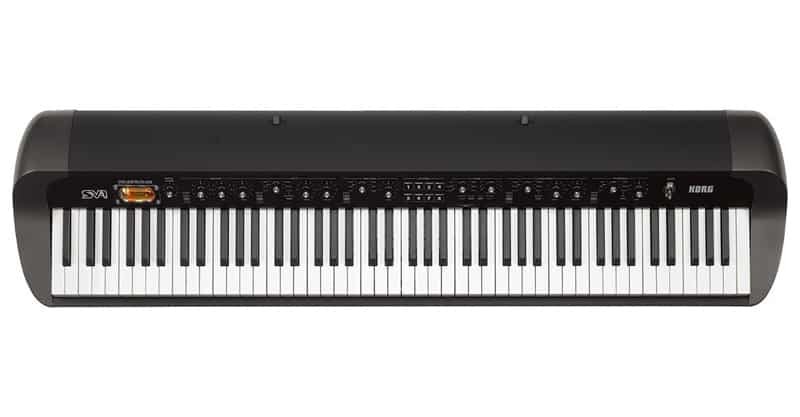 Coming in at only 25 pounds, it’s one of the lightest stage keyboards you can buy. It’s worth investing in a good hard case or flight case if you’re doing a lot of traveling. It will add to the weight, but it’s manageable. You can generally find Nords in 61-key and 73-key versions. I own the 73 and could never do with less keys, but depending on what you’re playing, 61 might be enough. Two quarter-inch outputs and one headphone output. Korg’s Kronos models are slightly less universal than the Nords, but only because they come in at a higher price range. These keyboards are seriously killer. I’ve been considering upgrading for a while now. It comes pre-loaded with a bunch of amazing sounds. It lags behind the Nord in the organ department, because the Nord Electro has drawbars, making customizing your organ tone very easy and realistic. The piano, EP, and synth tones are awesome. 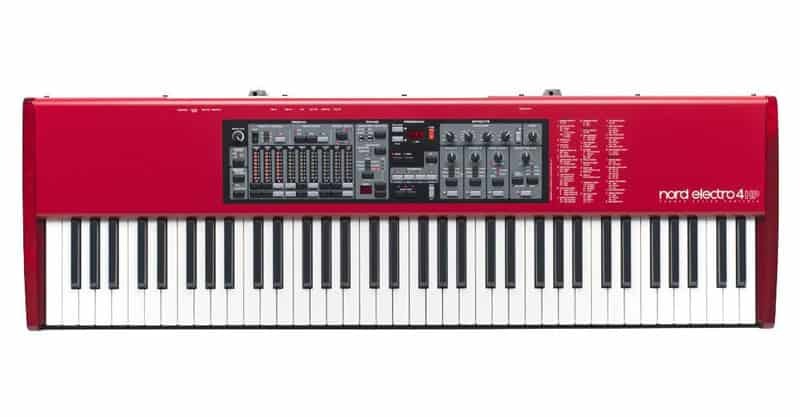 And, it has a few features that the Nord doesn’t have: It has a modulation and pitch controller in the form of a four-way joystick, and it has the ability to layer patches. The Korg sound engines are stellar. If you took any one of them and put them into their own keyboard, they would be perfectly legitimate stand- keyboards. The Kronos has nine engines in one workstation. 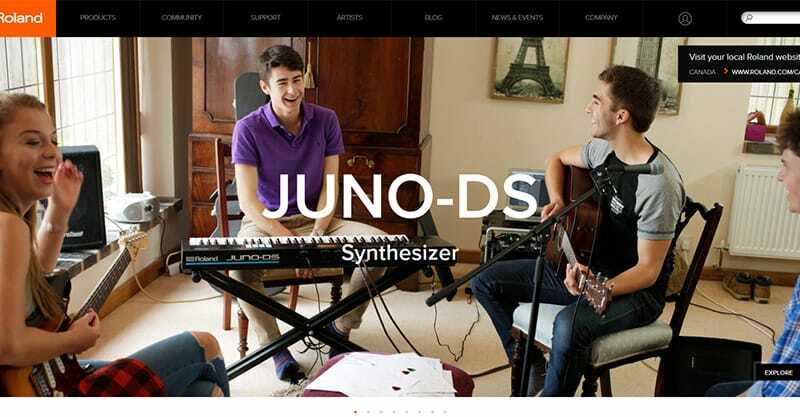 The Kronos is a music workstation, which is slightly different from your average keyboard. 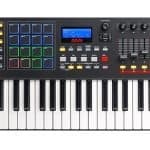 It has a 16-track sequencer, as well the ability to record 16 audio tracks, right onto the keyboard. In addition, the Kronos comes with a rack of effects, which can be run 16 tracks at a time. Anything you can create can them be sampled and turned into a keyboard sound using Korg’s Open Sampling System. Has modulation, pitch, vector control, 9 sliders, and 8 knobs. Six ¼” outputs, one stereo headphone output. Another Korg stage piano makes the list, but for completely different reasons. The Korg SV-1 is a very cool keyboard that gives you a ton of popular keyboard sounds and the ability to alter them using vintage, physical knobs. This keyboard specializes in classic tones: Vintage electric pianos, funk clavs, all the classic organs, strings machines, and pianos. In my opinion, this keyboard shines in the electric piano and piano department, making it a favorite for jazz players. I find the SV-1 to be lacking in the organ department. Because there are no drawbars, it makes it hard to use the organ tones like you would on a real organ. That said, the pre-loaded ones are good enough for most live situations. One of the best things about the SV-1 is the sound processing. You can enhance your sound with compressors, amps, and effects. The SV-1 has a tube built right into the keyboard. When you choose an amp setting for your sound, it runs through the tube, creating a great vintage sound. Like most Korg products, the back-end is well-designed. You can attach your Korg SV-1 to a computer and edit away – swapping your favorite settings, making playlists, and adding new sounds. Two ¼” outputs, two XLR outputs, one stereo headphone output. Whereas the last three pianos have been geared towards live playing, this one is a producer’s dream. 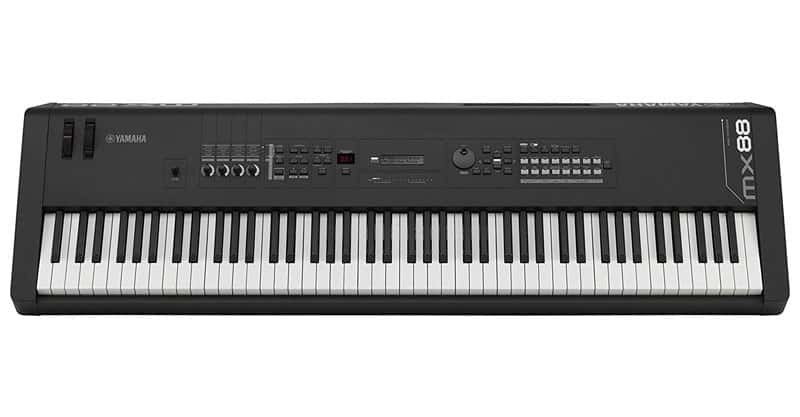 The Roland FA-07 is an affordable keyboard workstation with everything you need. For starters, it has over 2,000 beautiful sounds. The INTEGRA-7 sound module powers fat synth tones while the SuperNATURAL synth engine loads up stunning drum sounds, pianos, and more. Beyond that, you can add to the FA-07’s internal wave sound slots, creating sounds that are unique to you. Everything about this keyboard looks great. It’s got a nice big screen, an incredibly simple user interface, and a beautiful layout. It’s basically geared for optimal workflow when you sit down to write parts. While the Roland is totally geared for recording, there is no reason not to play it live as well! It’s easily programmable and has a ton of sounds. I wouldn’t say it’s as convincing as a Nord or a Kronos in terms of live playing, and the build is slightly flimsier, but I know several keyboardists who use them, so that shouldn’t prevent you from buying it. Pitchbend, Modulation Wheel, D-Beam, 16 Sample Pads. Two ¼” outputs, one ¼” sub out, one stereo headphone output. Last but not least is the stellar and affordable Yamaha MX88. This is a great keyboard mostly geared towards the stage, but can definitely be used at home or in the studio as well. This keyboard is fully-weighted, giving you the feel of a real piano. Yamaha is well-known for making some of the best feeling keys out there. 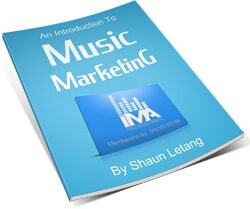 It’s loaded with over 1,000 classic MOTIF sounds. 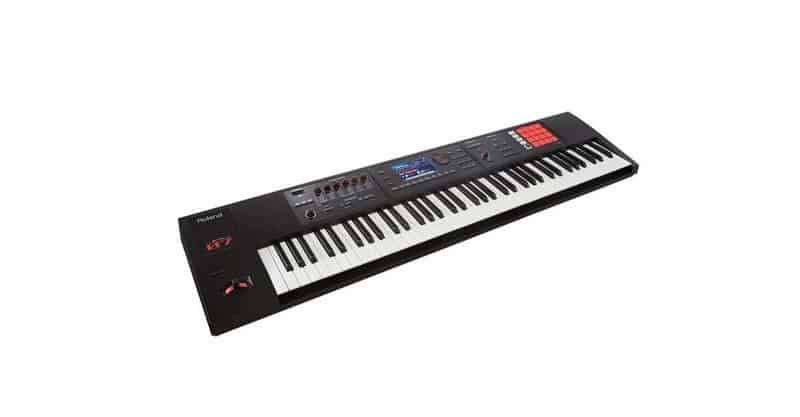 Yamaha MOTIFs are an extremely well-loved keyboard workstation used in pit bands and studios around the world. The MX88 has many of the same sounds, but is a little bit easier to use, and a little more geared towards the average gigging keyboard player. As far as sounds, it’s equipped with the MOTIF soundbank, as well as Yamaha’s VCM FX Engine, which has meticulously modeled vintage effects, from delay, to chorus, to reverb. The MX88’s stunning 128 note polyphony makes for lush pianos and thick synth sounds. You’ll sound right at home with basically any other keyboard, for quite a bit less money. The organ generator on the MX88 is very lacking. It’s somewhat unconvincing in general, and the weighted keys and lack of drawbars make it even less appealing. If you’re after organ tones, I would look at something else. All of the knobs and buttons feel great in your hands, and the interface for editing and storing sounds onboard is fairly streamlined. The screen is quite small, however, which is always a pet peeve of mine. Either way, this is a great option, especially as an introduction to professional stage pianos. 128 note polyphony, 16 part multi-timbral. Two ¼” outputs, one stereo headphone output. We’ve just looked at five of the best keyboards for recording and performing. You’ll be glad to know there isn’t a “lemon” in the bunch, but there’s a good chance one keyboard will match your needs more closely than the others, in terms of its features, sounds, keys, and so forth. Here are a few things to think about as you make up your mind about which keyboard to buy. There is a bit of a difference between piano and keyboard players. Piano players tend to be purists, wanting only to play with the best quality instruments (or, at the very least, an upright piano). 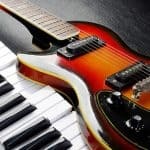 Experienced keyboard players also tend to have their likes and dislikes when it comes to keys, but are a little less fussy than piano players. When electric keyboards were still new, you didn’t necessarily have a lot of options. The keys typically had an artificial feel, and no action. You had to sacrifice playability if you wanted to sound like you belonged in that decade. These days, you can get keyboards with fully-weighted keys. So, if you have exacting tastes for your keyboards, or if you’re a piano player turned keyboard player, this may be what you prefer. Manufacturers are well-aware of these varying tastes and do what they can to cater to consumer demand. For instance, if you don’t like the Nord Electro’s waterfall weighted keys, you might prefer the MX88’s fully weighted keys instead. Sometimes, you can find the same model with different keys, too. You won’t know your preferences until you begin experimenting. If you aren’t sure, it’s worth going to your local instrument store to give different keyboards a try. More than just about anything else, the sounds coming from your keyboard will be a major deciding factor when it comes time to purchasing one. Whether you’re recording or performing, good tone is critical to feeling good about your instrument and the quality of your performance. As you can see from my analysis above, certain keyboards do some things well, and other things not so well. The Nord Electro, for instance, has great organ, piano, and Wurlitzer tones. Meanwhile, The Korg SV-1 may have great piano and electric piano tones, but it doesn’t have a convincing organ tone. It’s hard to find a keyboard that does it all, so it mostly comes down to preference and what you require as a player. If you know you’re going to be using certain sounds but not others, then you’ll want to buy a keyboard that performs well in the areas you need it to. The above keyboards all have their strengths and will not disappoint. Your buying decision will likely be based around the features offered by a specific keyboard, as well as how it sounds to your ears. Weight is an important consideration if you’re planning on gigging a lot, or for whatever reason you end up having to move your keyboard often. Naturally, if you’re going to be hauling your keyboard with you everywhere you go, you don’t want it to be too cumbersome. This can be a bit of a challenge, since you also want to be playing a keyboard that sounds great. Finding that balance between weight and sound can sometimes be difficult. One solution might be to purchase a keyboard with fewer keys for the road, and one with more for the studio. This helps keep the weight down a bit, and can also speed up setup and teardown at your shows. But like I was saying earlier, sometimes those extra keys are exactly what you need! The durability of a keyboard isn’t something that should be tested. A sturdy keyboard might survive a big drop, but a keyboard inevitably has some fragile parts that could easily damage, such as knobs, dials, switches, and keys. Still, if you’re going to be on the road a lot, you don’t want your keyboard breaking down on you when someone sneezes in its general direction. The durability of a keyboard isn’t necessarily something you can know without some experience. Playing with the keyboard for some time can give you an idea of the parts that need to be protected versus those that hold up to wear and tear. It can also give you an idea of whether you need more than a gig bag to protect it. As you can see from the above list of keyboards, price range can vary considerably, even when looking at keyboards that are similar in function and feature set. 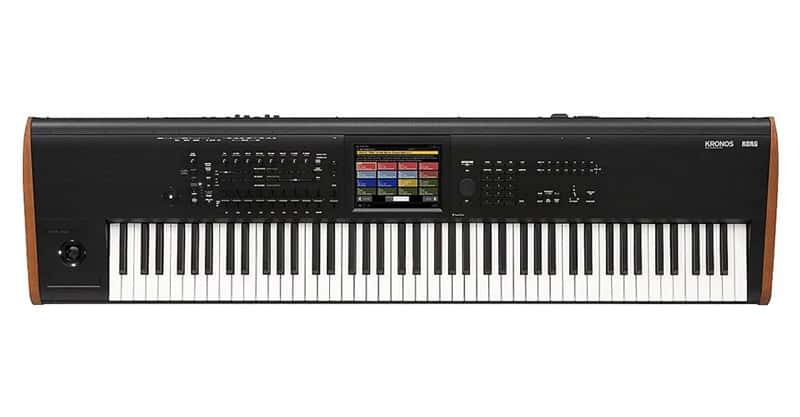 The Yamaha MX88 is available for about $1,000, while the Korg Kronos is about $3,700. That’s a relatively large spread in price. Ultimately, your budget is your budget, and it’s up to you to decide what’s right for you at this moment. I would suggest, however, that it’s best not to overextend yourself or go into debt to buy an instrument unless there’s an immediate upside to doing so. Technology might be an important consideration depending on what you’re hoping to achieve with the keyboard. As you’ve already seen, the Nord is an incredible choice for organ sounds, because it has drawbars built in. This makes it easy for you to customize your tones. You can also load new sounds onto the keyboard using their apps. The Korg Kronos, by comparison, is more feature-heavy. Its organ features may not compare to those of the Nord, but it has a modulation and pitch controller, the ability to layer patches, a 16-track sequencer, a rack of effects, and more. Generally, you pay more for more features. This is a good thing to remember when you’re considering your options (also see my earlier point about budget). In a sense, the more the keyboard has, the more futureproof it is, because in most cases you’re not going to suddenly wish you had fewer built-in features. But you might not get what you want in terms of keys or sounds if you choose based on the tech side of things. Buying the ideal keyboard is a balancing act no matter how you look at it. Any of these keyboards are going to serve you well. As you may have noticed, they vary in price quite widely, but all of them are professional keyboards. Make sure you do some looking around for a used keyboard before buying new, and consider how many keys you can get away with having – smaller keyboards are more portable and affordable. Enjoy playing your new keyboard!